Check out our unique Pueblo items! All proceeds benefit Downtown Association beautification and promotion programs. 719-543-7155 for more information. We welcome additional vendors. ​Discount Card or smart phone App! Good each time you visit a participating merchant through September 30, 2019. Just click the button for your app store below to purchase the Downtown Discount app, install and then show your phone to participating merchants. Here are discount card participants and the discounts they offer. Springside Cheese Shop, 10%off in-store mdse. Offers subject to change. Restrictions may apply. Card expires September 30, 2019. 100% cotton, machine washable, made in U.S.A.
of historic Downtown Pueblo, Colorado. El Pueblo History Museum, 301 N. Union Ave.
(Customer service kiosk in center of store. (Open most weekday mornings. Mail orders accepted. 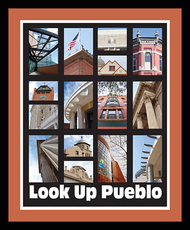 Do you recognize these Pueblo landmarks? Do you need security cameras for your PDA member business? Is your sidewalk damaged? We can help. Click here for details.